SETBACK: For Leeds United head coach Thomas Christiansen. LEEDS UNITED have confirmed that their opening pre-season friendly for their tour of Austria has been cancelled. The Whites were due to take on German outfit FC Ingolstadt in Kufstein on Sunday afternoon, but the Bundesliga 2 outfit announced on their official site on Friday lunch-time that the game had been called off. It is understood that the authorities in Kufstein were not willing to police what they saw as a ‘risk’ friendly. And Leeds have confirmed that the game will definitely not take place with the club only informed of the decision to cancel the game by Austrian local authorties on Friday morning. There are not expected to be any similar issues with United’s other two friendlies in Austria - against Borussia Monchengladbach or Spanish side Eibar. A Leeds United statment released on Friday afternoon read: “We are disappointed to confirm that Sundays friendly with FC Ingolstadt 07 in Austria has been cancelled. “The only information the club has received on the cancellation is that the decision was made by the local authority this morning. “Representatives from the club had travelled to Austria weeks in advance of the trip and confirmed the fixture making the decision even more frustrating. Chairman Radrizzani said from his own personal Twitter account: “Feel sorry for the fans who made plans to attend Sunday game (including me). Ingolstadt have reportedly arranged to play Mainz’s reserves at Mainz’s training camp tomorrow instead. Kufstein Arena has a capacity of just 4,500. 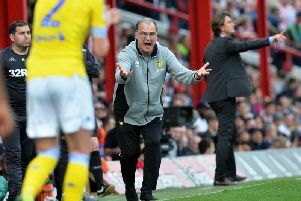 Leeds are due to take in two more friendlies on their tour of Austria with the Whites scheduled to play Bundesliga side Borussia Monchengladbach on Thursday for an for an early-afternoon kick-off at the Silberstadt Arena in Schwaz (2.15pm). United are then scheduled to play Spanish side Eibar a week on Sunday at the Jenbach Stadium (5pm).